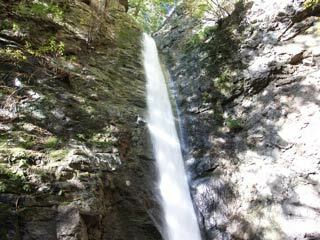 Senga Falls (線ヶ滝) is located Namboku Village, Gunma. It is 40m-tall waterfalls. It is made from a huge fault. The white line of waterfalls on the huge black rock is just like the drawing a white line. The Senga literary means the line. 3. use taxi to Sengataki. It is also know as 仙ヶ滝. Legend said, there was a beautiful woman whose name was Sen. She was an idol for all young men in the village, but she couldn't tie her hair. One day her mother in law, claimed her so bad, and she jumped over this falls with her hair dresser. After that, people started listening her crying at night.